The TWC crew have been working with the wonderful people at Thames Valley Housing to start a community allotment project in sunny Slough. 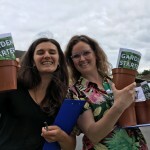 The site will be launched this summer and over the last few weeks TWC have been working with the residents at Moray Drive to start wiggling green thumbs. We kicked things off on Saturday 21st April by giving everyone a taste of allotment life. Moray Drive rolled up their sleeves and got straight to work potting some house plants, which are now growing away nicely on everyone’s windowsills. The response has been amazing! 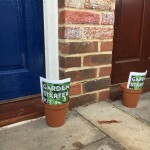 On our latest visit last Saturday (2nd June) the TWC team delivered gardening starter kits to households at Moray Drive. seeds, and were perfect for delivering in person or as a nice wee package to come home to on your doorstep. The kits were well received all round and a perfect way to try your hand at gardening at home. 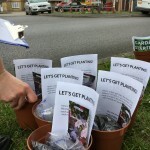 We also had some residents keen to post extra seeds to their neighbours – a great way to spread the allotment love at Moray Drive. cracking with some gardening on the site – fingers crossed for more sun!